In 1867 Thomas and Margaret Briggs gave four acres of land to this congregation. The present building was completed in 1905 and was later veneered in brick. Meetings held here in the 1940s and 1950s led to local court cases that helped bring about the U.S. Supreme Court’s landmark ruling desegregating public schools. 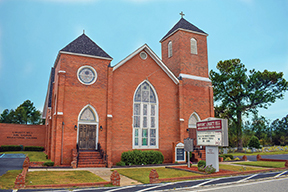 Nineteen members of this congregation were plaintiffs in the case of Briggs v. Elliott, heard in U.S. District Court in Charleston in 1952. Although the three-judge panel refused to abolish racial segregation in S.C. schools, a dissenting opinion influenced the Supreme Court’s decision in Brown v. Board of Education (1954).